This Microgaming’s three-reel slot is all but ordinary. With its busy design and a flamboyant background image, it has so many features that not even many 5-reel slots can boast. The game is played over a single payline accepting bets from $0.1 to $10 per line, per spin. Its symbols include classic cherries, bars and diamond-encrusted sevens accompanied by hip-hop-themed icons such as graffiti spray cans, microphones, massive golden chains and portable cassette recorders. During a normal game you can win a top jackpot worth x500 times a bet, or $5000 if betting max. To activate the feature-packed Board Game you need to fill in completely the number trail below the reels. 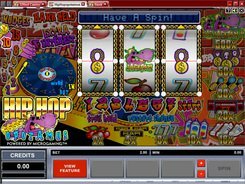 You will be then taken to a second screen featuring a board divided into several dozen marked sectors, each containing a specific award such as nudges, holds, Scratches, multipliers, win spins and a whole array of other minor and major bonus prizes to keep you entertained for many hours on end. PLAY FOR REAL MONEY!